There are certain things that are nonnegotiable in our family. Toilet paper should start OVER the roll. The only kind of guacamole is homemade. Walt Disney World is always the first response to "Where do you want to go on vacation?" And Christmas Eve always means fondue. 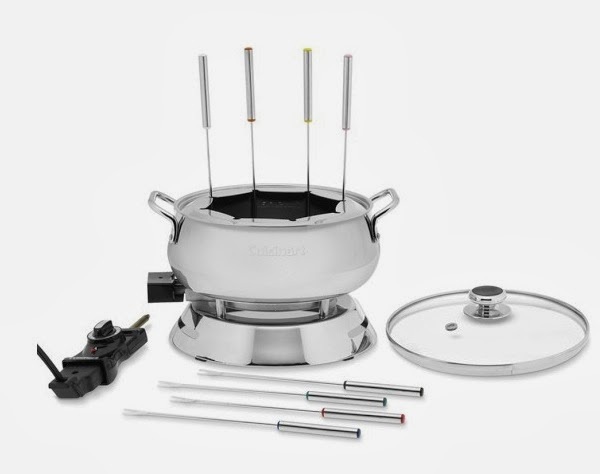 When we received the ubiquitous fondue set for our wedding we laughed and wondered when we would ever use something that was so associated with the 1970's. It was as much a throwback as was orange shag carpeting. Until one winter day in Connecticut when I stumbled across the fondue box that had never been opened. We were hosting a formal cocktail party and I thought it would be retro classic to feature fondue as an appetizer as we mingled. It turns out that while the Chicken Dijon and herbed Yukon Gold potatoes were delicious, it was the fondue that everyone couldn't get enough of. The following week was Christmas. In our family, Christmas Eve is the big day. On that snowy night by the fire, surrounded by family and friends, we gathered and tucked into pots of cheese and then chocolate fondue. The Christmas Eve Fondue tradition started that night and has continued ever since. Now, years later, we have perfected the fondue party. It really is the perfect party food. Some years our home is packed with friends and family and some years, well, it's more intimate but fondue seems to scale well, regardless of the crowd. Over the years I've tried dozens of recipes and to be honest, while homemade fondue is exquisite, it's also expensive to make from scratch with Swiss Emmental and Gruyere cheeses. You'll also need to think ahead because Swiss Emmantal and Gruyere aren't cheeses you typically keep on hand. 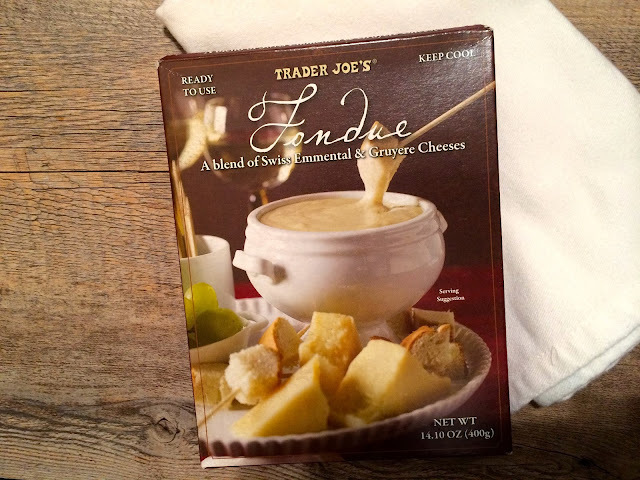 So, when I was in Trader Joe's last week and came across a package of cheese fondue I had to try it. While in the past, I've carefully and slowly prepared cheese fondue on the stovetop, taking care not to let the cheese burn to the bottom of the pan, this preparation was easy. I simply opened the package, removed the foil packet, opened it, poured the contents into a microwave safe glass bowl, heated it for four minutes (stirring halfway) and then added it to the pre-heated fondue pot. As the cheese was melting in the microwave (you can also heat it on the stovetop), I sliced some Granny Smith apples. I also cubed then lightly toasted day-old French bread and prepared store-bought gorgonzola and walnut ravioli. And so on a icy cold December night Larry and I sat down to a candlelit fondue dinner. He didn't know that the fondue wasn't homemade and he knows how long I have perfected the perfect cheese fondue. Which is why when he said "This is definitely among your best fondue recipes!" that I realized that the Trader Joe's cheese fondue was a hit. I had expected some akin to spray cheese in a can but instead, it was as good as a treasured family recipe. At $5.99 for a 14.1 ounce package, it was also economical. Typically, when I made fondue it can cost upwards of $25 for the cheeses, white wine and kirsch that make up the traditional Swiss recipe. It also stores better in the refrigerator than the cheeses themselves would. Would I serve Trader Joe's fondue again? Yes, absolutely. It was easy and just as rich and intense as my homemade version at about 1/5 the cost. It was also easy and something that you can always have on hand for guests or when you want to have a romantic dinner by the fire on a snowy winter's night.